From bottles to teats, the NUK 8 piece Nature Sense Perfect Start Set has it all! Ideal for infants between 0-18 months. 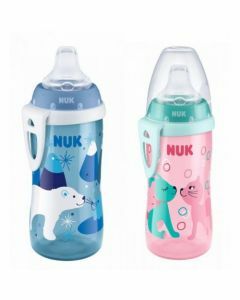 Bottle feeding has never been easier thanks to the NUK Nature Sense Perfect Start Set. This eight piece set comes with everything you will need at feeding time, from bottles to brushes this set has it all. The soft silicone teats in the NUK Nature's Sense range have been specially designed to replicate the milk ducts in a mother’s breast, to make your little one feel more comfortable while feeding.